What are the advantages of using a timber frame? Timber has been used in architecture for centuries, not only has it passed the test of time, but it’s a product that is full of heritage and natural benefits. Wood is both stunning and durable, and can be used to create many different structures. From commercial buildings to bridges, timber can be found as the main material in numerous architecture projects. So what makes timber one of the most successful frame materials to use in architecture? Saves you money – Timber is an effective insulation material, allowing little or no temperature transfer between the interior and exterior of the building. Its ability to store heat in winter will reduce your energy bills. Using timber also supports sustainable forestry; as a natural resource it is also friendly to the environment. Designed around you – Homes built with a timber frame have a strong exterior, allowing inner walls to be moved around or not used at all. This creates a large open feel with plenty of natural light. It also means that windows can be placed wherever desired within the strong timber frame. A stronger structure – Although not a huge problem in the UK, timber frame structures have been known to withstand earthquakes and hurricanes. The strong mortise and tenon joint designs can take huge amounts of pressure, creating a building that has substantial durability. Heritage – Timber framing has been common practice for centuries throughout the world. It is found in archaeological sites across the continents which shows what an important role timber has played throughout history. Using timber really does give you a sense of history, using one of the world’s oldest natural building materials. 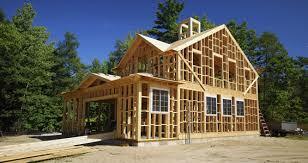 Timber can also be used to strengthen, insulate and protect the exterior of buildings. See our ‘Cladding’ page for more information.